I know. I this logo is at war with the title of this Monday’s blog. 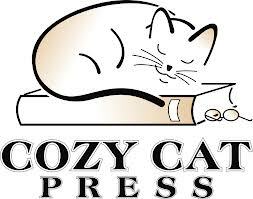 Cats are the preferred companions of sorcerers, witches, and cozy mystery writers. The problem for me is that I am a dog lover. I have owned cats and loved cats, but my nature calls for an animal that will obey me, love me, and never, never put up its nose and walk past me. Cats don’t need me so I wreak my revenge on them by featuring dogs, loyal and adoring. By now I’m sure you’ve seen the videos of dogs greeting their soldiers returning from the battlefield. They whimper, whine, bleat and throw all self respect to the wind as they celebrate their returning humans. I hope you’ve also seen the video mocking the dogs’ throwing their canine dignity to the wind. In the spoof, the master opens the door and calls out a name. The next shot is of a cat, yawning and nonplussed, looking in the direction of the sound and then returning to slumber. It’s funny–and all too true. No doubt about it, for me dogs are the ones who can be counted on to greet me at the door and know enough to wag their tails so they will be rewarded. 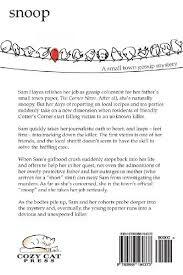 In Murder on Cinnamon Street, the dog’s name is Howler and like the dog Messy in my book Snoop, Howler is a mutt who gives the main character aid and comfort. When no one else is there for my character E Clary, Howler is. Those of you who love dogs know this to be the case. From the time we are little, we cry into our canine companions’ necks and sob away the troubles of our world. I tried it with a cat once with no success and more than a few scratches. 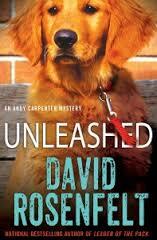 I love David Rosenfelt’s mysteries for a lot of reasons: their solid writing, well-plotted suspense-filled tales, and their dogs. Rosenfelt is a dog loving nut like I am, and his memoir of moving over twenty dogs from California to Maine (Dogtripping) shows it. But his fans love him for it. In his books the dog never dies and is anthropomorphized humorously and, I think, realistically. I read a story once in which the dog died at the end, and I never forgave the author. For those of you who have a boundless urge to punish yourself, I will tell you that the book was Farley Mowat’s The Dog Who Wouldn’t Be. Our tenth grade English teacher had us read a condensed version aloud in class and paid the price for his sloth with thirty high school sophomores, boys and girls, sobbing and yelling that they hated the book and him. If that teacher is still alive, I’m sure he remembers his worst teaching day ever. Other than that, he was a good and popular teacher. In Snoop (I’m showing the back because I’ve shown the front so much) the dog—spoiler alert!–is grievously injured, but I have made a promise to myself and my readers that no dog will die so I hope that consoles you. I won’t ever hurt a dog and think those who do should suffer humiliation and torment for the rest of their lives. Not long ago the dog torturer Michael Vick lamented that he felt bad his kids can’t have a dog. I feel bad that he has children because I’m convinced if you can abuse one helpless creature, human or otherwise, you are a threat to all creatures. I won’t hurt dogs and will feature them in all my books. And I will even have cats, as I do in Snoop, but I won’t favor them. They don’t need me, and like my main characters in Snoop and Murder on Cinnamon Street, I admit to needing to be needed. By the way, I’m sure my two dogs Chloe and Hannah would love a cat, a diversion for their owner who spends far too much time talking to them and hugging them. But it’s their tough luck they were born to bark and not to purr.